The Fancy Floral Butterfly Corner and Butterflies are real sparkly. I painted the corners with glue and sprinkled with Martha Stewart Glitter. 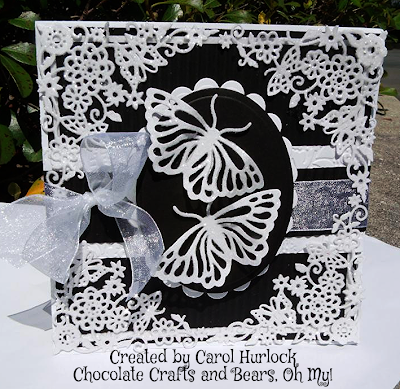 It's hard to capture the details of this card but I ran the black card stock through a crimper and embossed the white middle band. You are right about black and white cards always looking so elegant...and this one really does...Very nicely done. 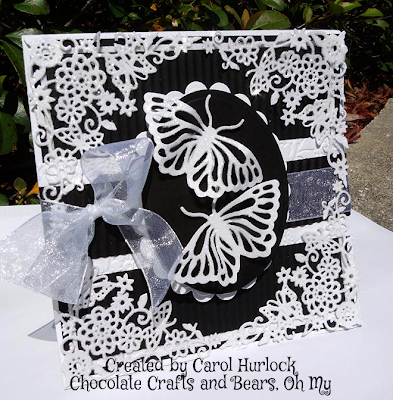 very beautiful and elegant card Carol. Ooh, what a black and white beauty...elegant, for sure. Love the lacy look going on here. Another winner!!! This is utterly beautiful! 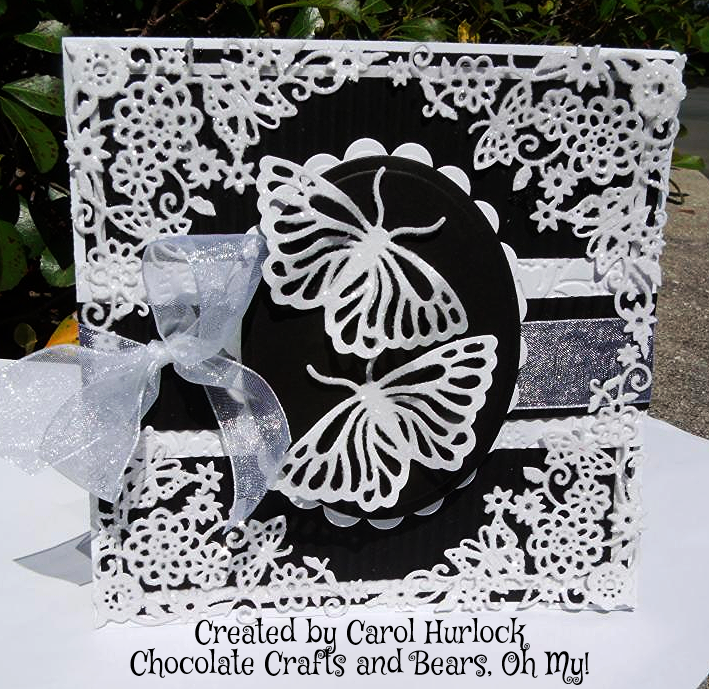 I love the lace corners, especially against the black background & the butterflies just make the perfect companion to them. Awesome card! 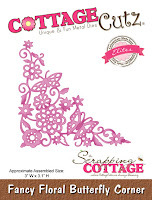 Wow - the die cuts and colors on this are so elegant and beautiful! Amazing stuff and so well designed (of course). I think there may only be 40,000 layers on this one - LOL. Hugz - lots of them! Hi Carol! I came over to see what you've been up to lately since I've been slack on my blog visiting because I've been out of town a lot recently. 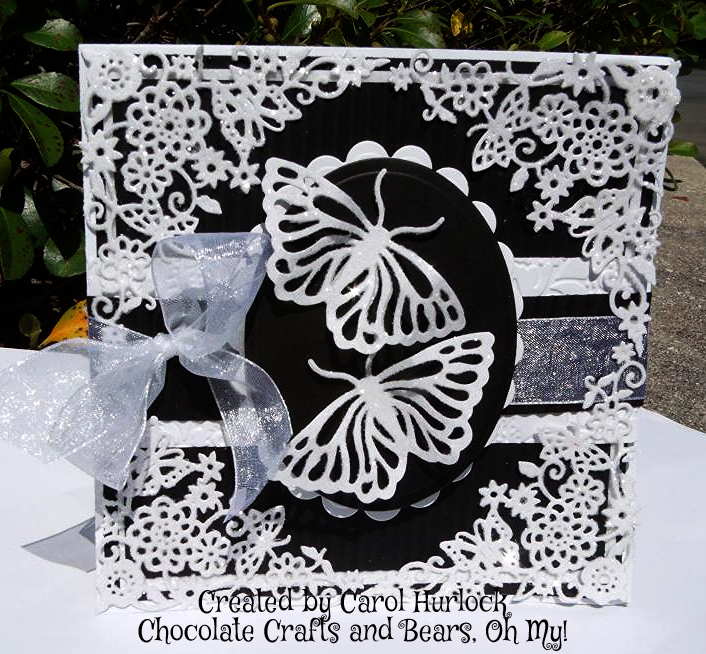 I knew I would not be disappointed in getting to see some gorgeousness on your blog.... this black and white card is absolutely stunning!!! All the die cuts are just so elegant! Hope you're having a great summer! This is just gorgeous!! Love those dies! I love black and white and this card is gorgeous. Honestly, you do us Punchiez proud, Bearzi. You've got the magic touch when it comes to dies and punchez. This is over the top gorgeous!